It's time to be true to you, regardless of what anyone might think. I don't believe we lose our voices, but rather we give them away. And I can see how I have done that. How I have made myself small, trying to fit into this mold of the suburban housewife. How I have pondered what to wear when I go out to my husband's office, because shouldn't I look the part of the dentist's wife? This from the girl who used to wear goth boots to work every day. In small pieces, here and there, I stopped expressing myself. I give love to others, but I give myself hell. I know that when I am not fully expressing myself, it means that I am not accepting all the varied and sometimes contradictory parts of who I am. And that is an unkindness to myself. 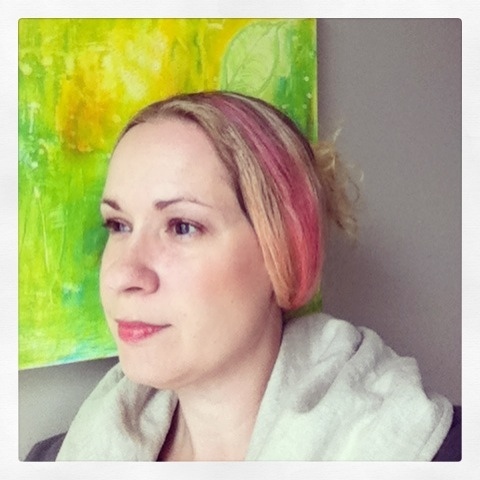 My new pink streak, a little reminder to be true to myself. These things can be small. It's a keeping quiet when your beliefs are not popular. It's choosing carefully what to wear to fit in. It's omitting parts of your story because someone might be made uncomfortable. But all these little moments add up. And when I say that I want to live an artful life, the most important aspect of that is living authentically. So I'm starting to be a little braver with my life. To be more fully who I am, and try not to worry about how others will perceive me. Because the only person I have to spend every day with for the rest of my life is me. So I'd better like that person or it's going to be a long and boring road.